I was going to use SLED10 for a while on my hp2133 mini-note, but getting updates is problamatic. If you call HP support within 30 days they will send you a SLED10 restore CD at no cost. 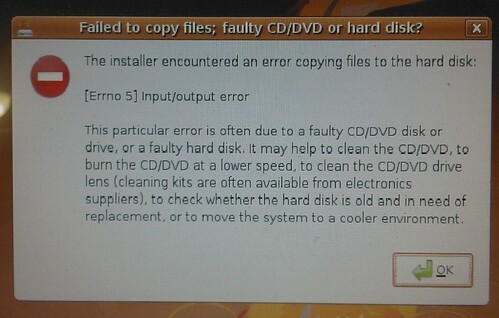 This CD is one of those boot-and-wipes-the-disk variety, so be aware. This CD is different from the ISO you can download from HP (here). Next up -- Ubuntu/Hardy Alternative Install CD. This version uses the tried-and-true debian install process and this time it works great! With the stock Ubuntu/Hardy it finds and configures the wired network, graphics, audio (except the earphone jack), MMC disk. The Broadcom Wifi does not however and needs to use the ndiswrapper with firmware downloaded from the hp.com support site. The post-install steps for Ubuntu/Hardy to get the WiFi working can be found on "WifiDocs/Driver/bcm43xx/Feisty No-Fluff". I found on my Ubuntu/Hardy that the bcm43xx module was already on the blacklist so the first line wasn't necessary. See line 32 of /etc/modprobe.d/blacklist. You'll still need to install ndiswrapper-utils-1.9 and create a tmp directory to unpack the wireless firmware. Step 3 is to install the firmware using ndiswrapper. My /etc/network/interfaces file already had an entry to the 'lo' device, so didn't need to do that. Also ran into problems trying to load the modules on boot, so I don't load ndiswrapper from /etc/modules. Also I didn't bother to edit /etc/default/wpasupplicant because on my home wireless network. I don't use authentication -- wireless access is locked down by MAC address at the wireless router. After a few seconds the NetworkManager applet will start looking for wifi networks and automatically connect. I've tried following the wiki's instructions on making it permanent, but found that there were nasty kernel messages about the ssb loadable module dying and preventing ndiswrapper from loading. The next post install step is to fix the audio driver. The sound card works okay, but doesn't turn off the speakers when a headphone is plugged in. The other great wiki page, https://wiki.ubuntu.com/LaptopTestingTeam/HP2133 has the solution. Essentially download and install alsa-driver-1.0.16_linux-headers-2.6.24-17-generic-1_i386.deb. Why hasn't a fix been pushed into the repositories is unclear. Although it may look like a lot of work, it wasn't that difficult. If you have problems, check back to the source wiki pages. Marc, forget the drivers I gave you yesterday. I found the drivers package Broadcom released in May. To bad I can't post them here. I have both the 32 and 64 bit drivers and the README file. The 32 bit driver built with no problem on OpenSuSE 11 and once I loaded the driver I was able to configure the the wireless connection with Network Manager. I just tried external VGA and that does not appear to be working. Other than that OpenSuSE 11 installed fine. I was able to get the vga port to work on the 2133 under Fedora 8. It also works under Fedora 9 - just cannot get the lcd panel to work. I get an illegal opcode exception when using the vesa driver (openchrome just will NOT work). F9 installs with no problem and you can use it with the external monitor. Of course, it's unacceptable that the lcd panel will not work under F9 when it works fine under F8 (but no sound under F8). I tried also installing minbuntu on the 2133. It installs but it is flaky. Installing ndiswrapper prevents it from booting (just to get minbuntu to install, you have to jump through some hoops to disable ndiswrapper during the install). I guess the selling point of minbuntu is that it automatically installs the via driver for the video (but the screensaver is somewhat flaky). I was amazed how easy it was to install (the directions are on the forum) and it works with the HP 2133. After I rebooted, the 2133 automagically connected to the network.